Please refer to our stock # 1-0408 when inquiring. Unusual mask with flat top, small forehead, relief pierced through eyes, protruding nose, open mouth showing pierced through teeth, short rounded chin. Wood, dark patina. Remnants of thin superimposed layers of polychrome pigments. Himalayan Region, early 19th century, probably earlier. Height: 10 1/4" (26 cm). The mask is nicely mounted on a custom metal stand which enhances its strange beauty. Old accident at base of chin, some erosion and flaking, otherwise very good condition. 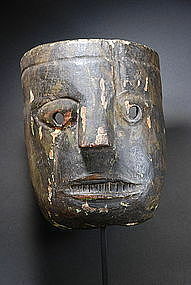 Note: this piece is part of a series of masks which were collected in the region from 1974 to 1979. Rare Himalayan Mask, Early 19th C. Rare & Unusual Himalayan Mask, Early 20th C. Household Protecting Mask, Himalayan Region, 18th C.